My pro-peloton watching year started close to the Pacific Ocean in California and closed in Boston, Massachusetts, with a cool stiff breeze blowing in from the Atlantic Ocean in late September. Two very different races that book-ended my memories for 2009. "It never rains in California, but girl don't they warn ya. It pours, man it pours." These famous words, written by English born song writer Albert Hammond in 1972, have been immortalized by many famous stars since Hammond sung his original version. In 2009 the Amgen Tour of California felt the full wrath of the worst that can blow in from the Pacific Ocean. Man it poured! California projects an image of perpetual sunshine brilliantly radiating down on such iconic places such as San Francisco, Los Angeles and Hollywood. To any uninformed members of the European peloton arriving at the 2009 Amgen Tour of California, the weather was obviously an extremely unpleasant shock. “Don’t they warn ya. It pours, man it pours." In fact the often frigid torrential rain and strong winds were more like the conditions that the fans in Flanders relish for the Ronde Van Vlaanderen and Paris-Roubaix. A huge public relations occasion was the much vaunted crossing of the famous Golden Gate Bridge with it’s backdrop of San Francisco and Alcatraz. The road over the bridge had been closed to traffic and apparently this had only been allowed three times before. So this was a huge deal. The Astana team organized a special fleet of photographers to capture Armstrong and his team in what they hoped would be epic images as they crossed the bridge. What they got was a rain lashed peloton huddled together wearing rain capes (and thus obliterating team colors) as they were lead across the bridge by an armada of vehicles piercing the saturated gloom with their headlights. My first encounter with the race was high in the Angeles Mountains behind Pasadena on the slopes of the Mill Creek climb during Stage 7. The number of fans up there was a real surprise. It felt and looked like a day in the Alps at the Tour. Everything was there including fans in all sorts of strange attire, numerous police motorbike outriders, team convoy vehicles and TV helicopters hovering overhead. About the only missing element was the famous advertising convoy that precedes each Tour stage. Mercifully the apocalyptic weather conditions had left the Tour in peace by Stage 7 and it was a dry peloton that ground its way up to the electric atmosphere of awaiting fans. Once the race passed by I had no plan other than to find my way back down the mountain. Being new to the region I just followed the crowds. By sheer dumb luck I accidentally drove into the area of the finishing circuit in Pasadena and was astounded to find huge crowds. Again Lady Luck was on my side and I was able to park the car right by the course. Police estimates on the day stated that there were over 50,000 people lining the 5-mile finishing circuit around Pasadena’s famous Rose Bowl. I had never seen anything like it at a bike race in the USA. Rinaldo Nocentini (Ag2r) eventually won the day. Little did we suspect that he would distinguish himself five months later by wearing the leaders Yellow Jersey at the TdF for eight days. The next day, Stage 8, was both the final stage and the one everyone had been waiting for. The organizers later stated that over 300,000 people lined the 97 mile route to make a grand total of over two million for the entire Tour. The high point for the Tour, literally, was the 13 mile climb up to the summit of Mt. Palomar at 5,500 feet. “It felt like the Alps in July,” overall race winner Levi Leipheimer said, “not California in February.” Being about 200m back from the summit prime, I can attest to that. It was a like a mad-house up there and had basically become party central for the day. I spoke with quite a few spectators and discovered that a large majority were not regular cycling fans. Lance Armstrong, making his big US comeback from retirement, was the unquestionable magnet. So many people simply wanted to see the legend in action before he does hang up his wheels for good. I have seen Armstrong powering up many TdF climbs and on this day he was looking his good old self. But my favorite memory was to see Jens Voight driving the peloton towards us with his trademark ‘mouth wide open’ grimace. The State of California loves the Amgen Tour but it does not like the world to see its bad weather. For 2010 the race will be run in May and at that time of year endless sunshine is virtually guaranteed! By late September racing has usually ceased in most of New England. Thanks to the hard work of former pro-racer and Olympic racer Nicole Freedman, Boston was treated to its first city-center cycle races in over 20 years. Nicole, dubbed Boston’s cycle Czar (maybe that should be Czarina), is working with Boston’s Mayor Menino to transform Boston into a bike friendly city. The Mayor’s Cup is one of many initiatives helping Boston move towards that vision. With significant sponsorship support from the TD Bank, the project went from concept to implementation within the space of about three months. 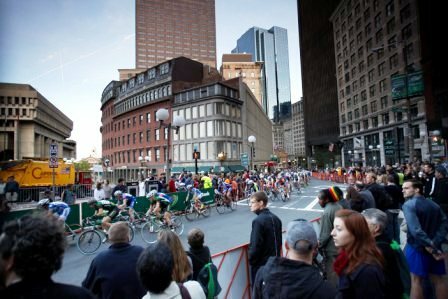 For anyone familiar with Boston it was unbelievable to see the roads circling City Hall Plaza shut down for a bike race. The local police, city workers and a small army of volunteers transformed the area into an event worthy of any high class pro race. About 60 women and 120 men treated the large crowds to some spectacular racing. Possibly the most impressive aspect for the greater number of spectators was to see a large highly colorful and tightly knit peloton hurtling around the race circuit at speeds averaging close to 30mph. Most of the crowd did not know that you can ride a bike that fast for a sustained period. In fact on a normal day you cannot drive a car that fast on those tight and crowded inner city roads! The day not only signaled the close of the local racing season, but also for Tina Pic it was her very last race of a long and highly successful pro racing career. And she finished her racing days in the best possible manner by winning. We don’t need no stinkin’ radios! "Holy hell. That was terrible. Maybe one of the toughest days I've had on a bike, purely based on the conditions". So said Lance Armstrong at the end of Stage 1 of the Amgen Tour of California. For Francesco Mancebo (Rock Racing), the solution to beating the brutally cold rain was to attack early and then ride hard to stay warm. A few kilometers into the race Mancebo fled the cold and miserable peloton and after 173kms of racing he had more than earned his stage victory. For most of the day Mancebo was alone and then with 5kms to go Jurgen van de Walle (Quick Step) and Vincenzo Nibali (Liquigas) caught him. After spending all day out front Mancebo surprised everybody by taking out his two new companions in the short uphill sprint finish. The stage and the Yellow Jersey were his. To me, Mancebo’s ride that day was one of the most memorable of the entire 2009 season. Adding to the quality of the ride was the fact that the incredibly foul weather had knocked out reliable radio communications. In fact for most of the day TV coverage was also lost. There is a huge furor surrounding the UCI’s current efforts to eliminate race radios completely. At the Tour de France they wanted to test the concept on two stages. Huge team and rider resistance reduced the experiment to one stage and on that day the rider protest turned the test into a debacle. Why does the UCI not remember the first three days of the ToC? There was no better test under real race conditions. For Mancebo he was out there not knowing where the peloton was and for their part the normally radio controlled riders in the bunch had no voices in their ears telling them what to do. Team Directors like Johann Bryneel were sitting in their cars stewing at the loss of information. And what did we get? A real race, epic in proportions, with the riders having to use old fashioned race sense to guide them. For stages 2 and 3 the weather continued to play havoc with communications, but again we were treated to fabulous racing. The time has come to eliminate race radios and the radio controlled zombies that we call professional racing cyclists. Learning to read a race and implementing strategies and tactics while out on the road was a major skill of champions past. Watching breaks shut down with clinical (GPS guided) precision is not what bike racing is all about. “We don’t need no stinkin’ radios”. Francesco Mancebo won Stage1 of the ToC in the good old fashioned way. Sadly he was to leave the race a few days later in tragic circumstances. Every media report that I have read simply states that he crashed hard dropping down from the Angeles Mountains on Stage 7 into Pasadena. After the race that day I caught up with Tim Johnson in his team bus and he told me what actually happened. He and a few others were descending fast when a rider close by dropped his chain. Francesco came up beside the rider and put his hand on his back to guide the guy as he reached down to try and get the chain back on. Apparently the two of them got too close to the edge of the road and the Spaniard, who was on the inside, slipped off the road and into the rock rubble that flakes away from the steep sides of the mountain. He went over the top of his bars and face first into the rocks. As Tim so rightly said “he did not deserve that”. The Cavendish express: Mark Cavendish notched up 23 wins this past season. Having been told by every expert and their mother that he was still too young to consider winning one of the ‘Five Monuments’, he promptly took out the Milan-San Remo in a fantastic sprint against Heinrich Haussler. All of the experts had confidently predicted that ‘Cav’ would get dropped up the Cipressa and/or Poggio climbs. So much for experts. As the season rolled on Cavendish continued with his incredible winning ways including a load of stage wins at both the Giro and Tour. Perhaps one of the most memorable was his win on the last day of the Tour as he tore up the Champs-Élysées. The reason for the memory is because of the unusual TV camera action that day. Like a swim race where the cameras run parallel with the swimmers, a mobile camera was racing on a track beside the road for the final kilometer or so. Watching the Columbia-HTC lead out train up close and personal left an indelible image. Like a run-away freight train George Hincapie lead Mark Renshaw and Cavendish into the final km. Through a dodgy chicane Renshaw took over at warp speed to deliver ‘Cav’ to the line with a huge gap. There was no way anyone was going to beat Columbia-HTC into Paris! Armstrong and Cancellara: Stage 3 of the Tour traversed the windy plains of the Carmargue in Southern France. It was here that Columbia-HTC gave the Tour peloton a lesson in racing and in so doing sewed panic into the frantically chasing bunch. With about 32kms to the finish Team Columbia had massed to the front end of the bunch and as the race direction turned abruptly, suddenly put the hammer down. Anyone who has raced the windy plains of Flanders knows what this means. Just 28 riders made the split (including the entire Columbia team!). 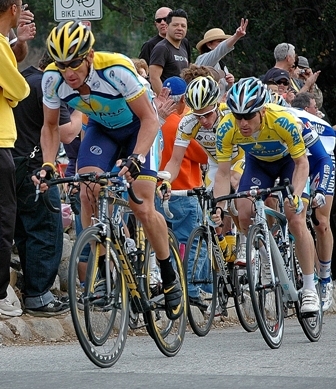 Amongst those savvy riders were Lance Armstrong and Fabian Cancellara (in Yellow that day). "You know what the wind's doing, you see a turn's coming up, so it doesn't take a rocket scientist to figure out that you have to go to the front. I wasn't waiting, just trying to stay up front and stay out of trouble and then it happened," said Armstrong. Post race Cancellara stated simply “I know how to race”! This incident threw a load of coals on the slowly glowing fire being stoked up by the media pitting Armstrong and teammate Alberto Contador against each other. As the race moved on the rift between the two champions was slowly revealed. However I believe that Armstrong is correct when he says that Contador still has much to learn about racing. And Stage 3 of the 2009 TdF should be burned into Contador’s memory as one of those racing lessons! Silence is golden: all season Silence-Lotto seemed to be cursed as the ‘almost team’. Their star one-day rider Philip Gilbert had achieved a string of excellent performances during the Spring classics but he had been unable to grab a big win or even a podium spot. Their Grand Tours man, Cadel Evans seemed to be hobbled with bad luck compounded by mediocre team support. At the Tour, while contending for a podium spot, he had a bad day and slumped to 30th on GC. Even worse, at the Vuelta, where in the last week he looked poised to take the race leadership from Alejandro Valverde, he suffered a puncture at a critical moment on a major climb. This incident put him back over a minute and destroyed his overall GC chances. So with such a lackluster year behind them, one would be forgiven to think that Silence-Lotto had no more interest in the last weeks of the 2009 road season. Then within a space of ten days Philippe Gilbert won the Coppa Sabatini, Paris-Tours and Giro del Piemonte. All highly prestigious events. Next up was the World Road Race Championship and while Gilbert was obviously still pedaling with ‘glass cranks’, it was a Vuelta fit Evans who surprised the world to become World Champion. Run under National Teams, trade team mates of different nations are not supposed to help each other. When Evans accelerated away in the closing phase of the race, Gilbert did not exactly help Evans but rather did not assist Cancellara in his desperate effort to get back up to Evans. With three significant wins by Gilbert and the World Championship won by Evans in less than three weeks, Silence-Lotto could now happily look at 2009 as a success. However as it turned out Philippe Gilbert was still on fire and produced a brilliant win at the Giro di Lombardia. And with this victory Silence was truly golden. Watching Fabian Cancellara glide over the roads of Mendrisio in Switzerland to claim his third World Time Trial Championship in 2009 was to watch cycling perfection. Everything about the image from man to machine was simply awe inspiring. His riding style is impeccable and the speed that he propels his bike is unbelievable. Had he not focused on the Olympics instead last year, then this would probably have been his fourth World Pro TT Championship. But having an Olympic TT Gold Medal on your mantelpiece is not too shabby either. Whenever Cancellara races I make an effort to see him. His World TT Championship this year was a connoisseur’s delight. It is not hard to believe that we are fortunate to be witnessing a legend in the making. If anyone asks me what were my spontaneous memories of the 2009 pro road season, my answer is written above. All season there were tremendous rides by numerous teams and numerous riders. But time is a cruel filter and as the days and months pass only certain memories percolate to the surface. If I think harder I can recall many more but for whatever reason ‘the short list’ is what will feed the history books. 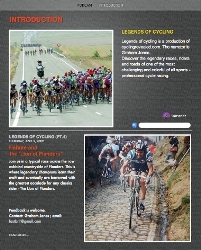 Write to us with your favorite memories of 2009 and we will publish them here on cyclingrevealed.com.